Western Wrothgar is the western region of Wrothgar. It has a milder climate than the rest of the zone, and consists mainly of boreal forests. The ruins of Old Orsinium can be found here, along with the Friendship Gate linking the zone to Stormhaven. 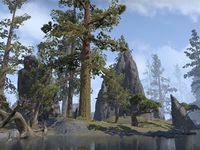 Like the other two subzones of Wrothgar, Western Wrothgar is distinguishable by its climate and little else. It has no associated questline or achievements, and has been left purposefully unnamed in-game.